Manila, Philippines- The weather bureau PAGASA released today bulletin updates for "Bagyong Caloy" (#CaloyPH). 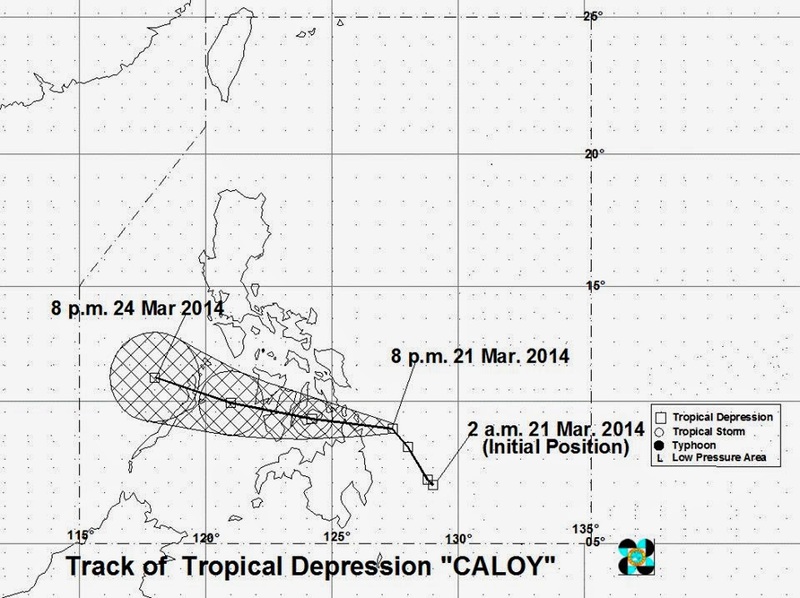 Issued at 11:00 PM, March 21, 2014, tropical depression "Caloy" has maintained its strength as it moves closer to Surigao del Norte. Sixteen (16) areas in Visayas and Mindanao are now under Signal No. 1. At 10:00 PM today, the center of "Bagyong Caloy” was estimated based on all available data at 160 km East of Surigao City (9.6°N, 127.0°E). "Typhoon Caloy" has a maximum winds of 45 kph near the center with forecast to move West Northwest at 15 kph. “CALOY” is expected to be at 50 km South Southeast of Cebu City by tomorrow evening and at 25 km South of Cuyo Island by Sunday evening. By Monday evening, it is expected to be at 200 km North Northwest of Puerto Princesa City. PAGSA said that public storm warning signals are now lifted. Residents living in low lying and mountainous areas under public storm warning signal #1 are alerted against possible flashfloods and landslides. Estimated rainfall amount is from 5 – 15 mm per hour (moderate - heavy) within the 300 km diameter of the Tropical Depression. Fishing boats and other small seacrafts are advised not to venture out into the seaboards of Northern Luzon and the eastern seaboards of Central Luzon and Eastern Visayas due to the Northeast Monsoon.